M/Sgt. John Del Grosso, of Cleveland Street, Belleville, died Nov. 8 in the Naval hospital at Corona, Calif. He had been under treatment for pernicious anemia - a blood disease, and in spite of several blood transfusions, succumbed suddenly after a short illness. With him in California, were his wife, the former Blanche Orlando of Race Street, Nutley, and his sons Jack, 11, and Bob, 9. He is also survived by his mother, Mrs. Minnie Del Grosso of Newark. 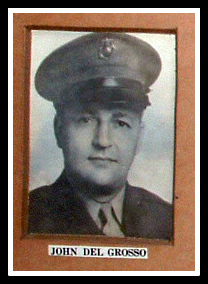 A Marine for four years before the war, and honorably discharged, Del Grosso re-enlisted shortly after Pearl Harbor. He had learned to fly in Nutley, and hoped for overseas service. He was stationed, however, at the Naval Air Base at Santiago, Calif., as a technical instructor where he was joined by his family about a year ago. There was plenty of action even in California. Sgt. Del Grosso was on flight duty, making repairs and testing planes. Nutley residents remember John as the Scoutmaster of Troop 7 and a member of the Franklin Reformed church. He was a watchmaker by trade, and for several years had his own business here.